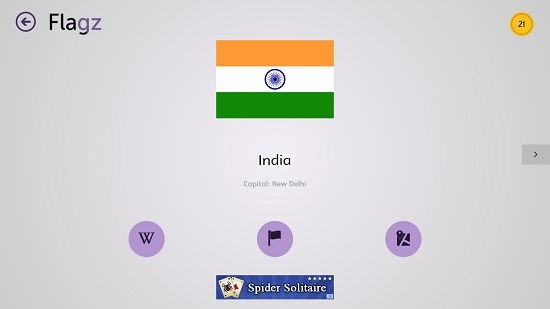 Flagz: The Flag Quiz is a free flag quiz app for Windows 8 and 8.1 in which you have to guess the name of the country based on the flag shown on your screen. The app is very lightweight and easily makes for a great download on devices running Windows 8 or 8.1. 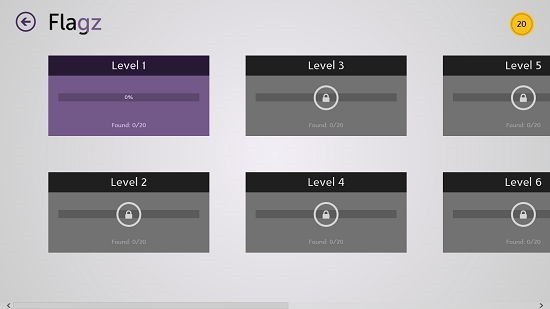 In the app, you get to choose various levels according to difficulty. Once you have guessed the flag correctly by typing the correct name of the country in the text field, you will be shown the capital of the country as well as the options that allow you to locate the country on the map. If you click on the map icon, the pre-installed map app will open up in a snapped mode showing you the country’s location, which makes for a pretty cool feature. 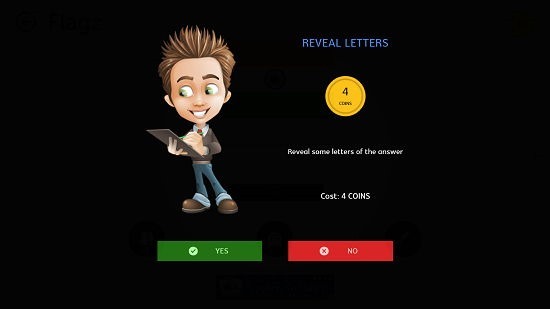 Flagz: The Flag Quiz is available for free from the Windows App Store. When you install and run the app on your device, you will be presented with an interface which looks like the screenshot below. 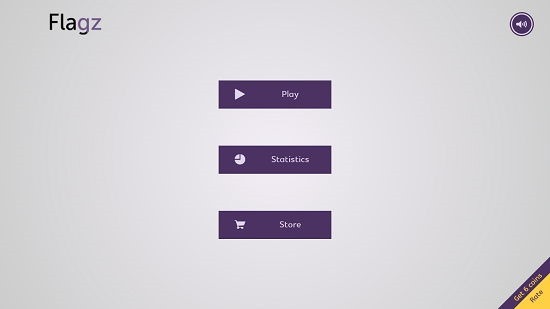 Simply click on the Play button, and you will be taken to the level selection screen. Upon selecting a level, you will be taken to the gameplay screen, a snap of which is shown in the screenshot below. In the above screen, as you can see, you are shown the flag of the country at the center of the screen along with a text field at the bottom of the flag. 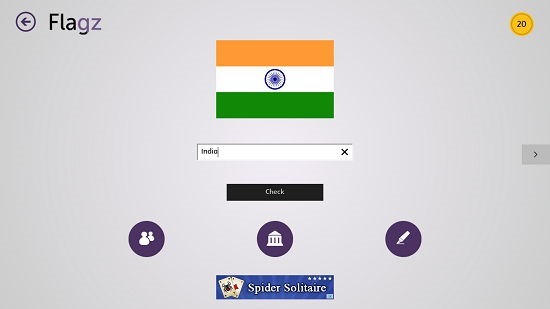 In this text field, you have to type the name of the country which you think is represented by the flag shown. You can also choose to use hints by clicking on the round buttons at the bottom of the screen. The button at the bottom left allows you to share the flag with your friends via inbuilt Windows 8 sharing options by firing up the share charms bar from the right side of the screen, or you can click on the button at the bottom center to reveal the capital of the country whose flag is shown. Similarly, you can click on the button at the bottom right if you wish to reveal a few letters of the name of the country. Once correctly guessed, you will be shown the screen as can be seen below. 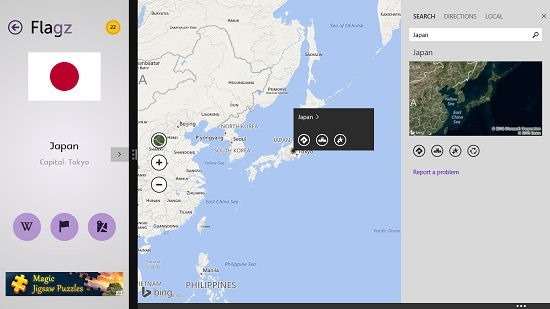 When you correctly guess a country, you can click on the map button at the bottom right to open up the marker of the country in the native Windows 8 maps app. This makes for a really cool feature. You can see that the app gets snapped and the maps app opens at the right with the location marker of the country displayed. This wraps the main features of Flagz: The Flag Quiz app for Windows 8 and 8.1. Flagz: The Flag Quiz makes for a great download on any or all devices running Windows 8 or above. The game is really cool and well designed, and you should definitely check it out by heading over to the link below. Get Flagz: The Flag Quiz.